A geotechnical model is the fundamental basis for the design of an open-pit and underground mines. A fully understood and representative geotechnical model provides information on the engineering characteristics of the rock mass, defining how it will behave during excavation. The model’s individual domains, each comprised of materials exhibiting internally similar geotechnical properties, reveal the critical characteristics and risks that the mine planners need to understand to design the optimal mine. The Cukaru Peki Upper and Lower Zones are part of the Timok copper-gold project. Nevsun Resources Ltd. owns 100% of the Cukaru Peki Upper Zone; the Lower Zone is a joint venture with Freeport-McMoRan Exploration Corporation. The Timok project is located centrally within the Timok Magmatic Complex (TMC), which has one of the highest concentrations of copper enrichment in the Tethyan Belt. The upper zone of the Cukaru Peki mineralisation occurs at depths between 400 and 800 m below ground level. The deposit does not outcrop at surface; it is buried beneath Miocene Clastic Sedimentary rocks that unconformably overlie the Upper Cretaceous Bor’ Conglomerate and Bor’ Marl. The Unaltered Andesite sits below the unconformity and the Lower Andesite below that. The high sulphidation epithermal mineralisation found within the Late Andesite comprises massive and semi-massive sulphide. Pyrite is the dominant sulphide mineral, and the principal copper mineral is covellite with lesser enargite, bornite and chalcocite. Gold is associated primarily with the copper sulphides. The top of the mineralisation is constrained by the unconformity and the lateral extents are constrained by faulting. Several alteration assemblages have been grouped into four types with mostly Phyllic and Propylitic alteration at its base. The mineralisation is found within the Advanced Argillic with higher grades of copper and gold near the cap and then decreasing with depth. SRK’s early involvement in the exploration drilling was key to setting up the geotechnical data collection. A flow chart sets out the approach to geotechnical data collection and modelling for the preliminary economic assessment study. 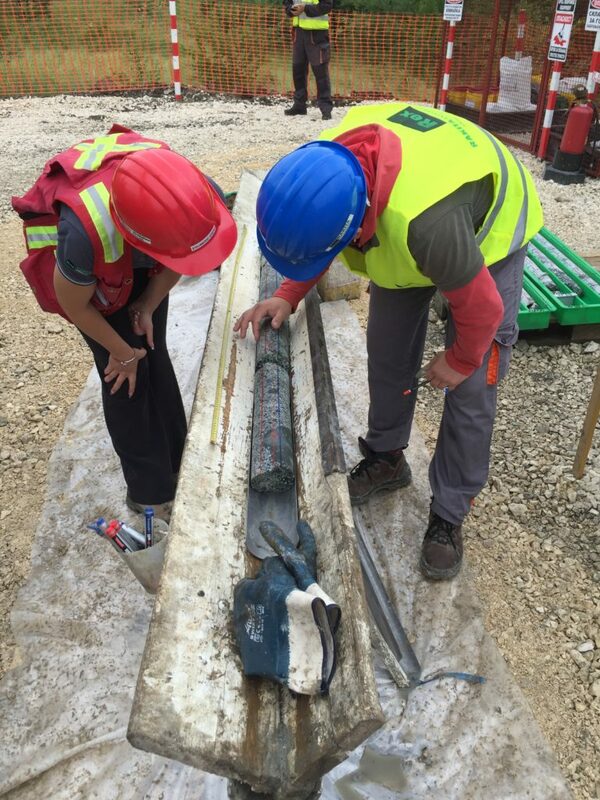 A logical approach was used to develop the geotechnical model taking into consideration the geological, alteration, and structural conditions for the deposit. There is good correlation between the geological framework and geotechnical parameters. The visual assessment and data modelling indicated that the spatial variability in the geotechnical parameters correlated well with the geology, alteration, and structure. A statistical analysis of the geotechnical parameters assessed each domain’s representation of the geotechnical conditions. A thorough assessment of the rock mass was based on the geology, structure, and alteration models. The geotechnical data was spatially and statistically analysed relative to these models to understand how the geology and structure affected the rock mass engineering properties. The structure and alteration were controlling the variability in rock mass characteristics and the models were used to generate the geotechnical model. The data in each geotechnical domain was used for generating parameter inputs to the cave mining study. The real value added to mine planning came from knowing how the combined individual-models created a geotechnical model that was representative of the actual conditions.